Alder Soundplane prototype with blanks of reclaimed redwood and Doug Fir. Photo by Randy Jones; used by permission. On tablets, on displays, multi-touch control these days is calibrated largely as a software interface – more Starship Enterprise panel than violin. As such, it works well for production tools and exploring compositional ideas. But it falls far short of being an instrument: even on the much-hyped iPad, touch timing and sensitivity is too imprecise, and the absence of tactile feedback and real, kinetic resistance makes you feel like an operator rather than a musician. 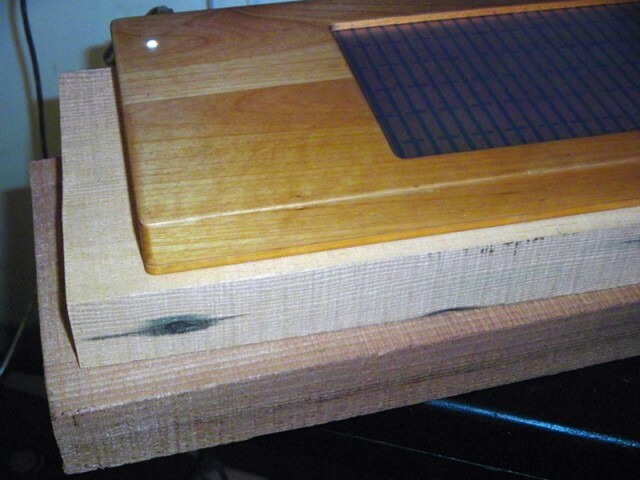 The good news: Randy continues working on the Soundplane, and Aalto will help. Continuing our interview, here are the thoughts most relevant to Soundplane — and a glimpse of what it’s looking like as he works on it in the lab. First, Randy explains his ideas about running a small business, continuing what he had to say in our Aalto story. 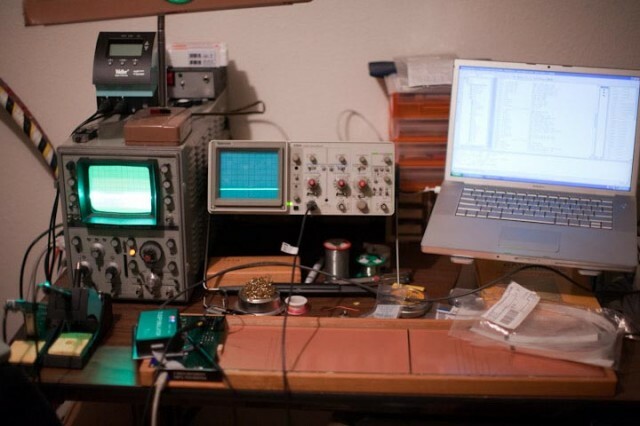 The basic idea: Aalto’s software will bootstrap Soundplane’s hardware. I think the whole idea of venture capital is sort of a poisonous one. It’s a little like bands wanting to get signed right away. The first thing you want to focus on is giving up your autonomy, really? Instead, why not scrape together whatever you can from friends or family and just make something that you can sell right away, however small. I didn’t have enough saved to finish the Soundplane project so halfway through I switched to putting out Aalto as a plan B for paying the rent. Now it’s out and it’s a product I’m proud of that I think reflects where we’re coming from, and it’s going to fund Soundplane development, and it’s letting tons of people know we exist. Just get a foot in the door, do something useful. Some people won’t like to hear this, but I applied for a patent on the sensor used in the Soundplane. I know, the patent system is totally broken, and often, if not usually, used in stupid ways. But if there’s one thing I think it is actually good for, it’s to protect small companies like ours that innovate against a bigger entity simply stealing their R&D. This is why it was designed, right? I don’t know if our patent will save the day if such a thing ever happens, but if it does I’d much rather have one than not. It’s a pain to write one but it’s not impossible, you just need a lot of patience. “Patent it Yourself“, Nolo Press, is a good reference. The patent question raises some additional questions for me – in fact, I’d love to see open source hardware that’s also backed by patent protection, in the same way that the GPL license is made tenable largely through the existence of traditional copyright laws. But I do tend to agree that in the case of a truly novel technology, which this is, patent protection may be necessary. The question for projects like this will be whether to operate as a conventional, patent-protected design, or whether some sort of open source model with a patent covenant and a copyleft license like GPL will make sense — both preventing exploitation and allowing free experimentation. If there are any IP lawyers lurking around out there, let us know (I have some contacts, too); and definitely let us know if that’s a conversation you’d like us to continue. 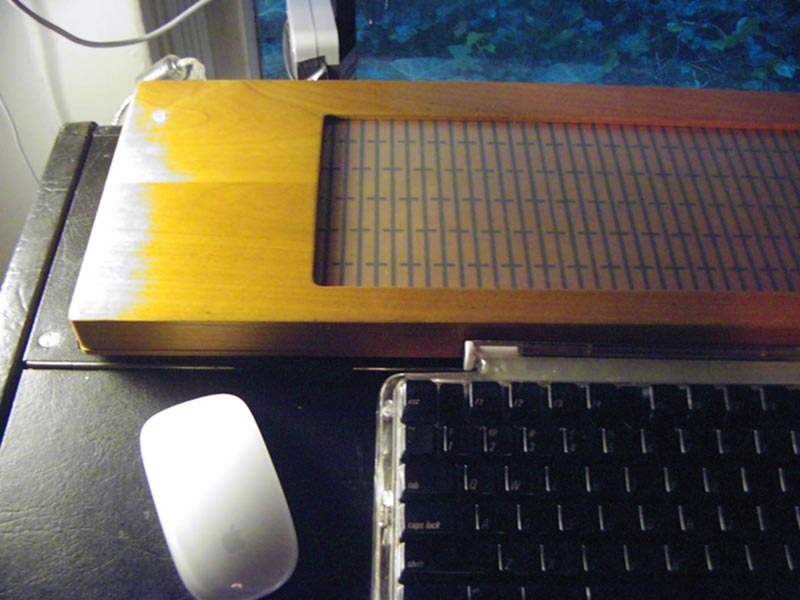 In the meantime, the important thing is that Soundplane lives, and using Aalto could help it come to fruition. We’ll absolutely keep you posted. Photos by Randy Jones (top) and Brian Willoughby (bottom). The whole article is worth reading, but Jones argues that not only is it likely many people will try to do tactile multi-touch, but it may be necessary. For those of you not all that good at hardware design, you could be just as essential as well to there being any future for these curiosities. The designers need other designers. The hardware needs software creators – lots of them. The software creators need to try lots of ideas. And everybody needs players, composers … users. Historically, revolutions aren’t solo pieces. They’re ensembles.